It’s not quite the numbing sense of inevitable failure that defined the late Slaven Bilic era, but discontent at the London Stadium has risen from its brief slumber. Seven points and three clean sheets in their last three games, including a win over champions Chelsea, had quelled some of the sense of rebellion in the shallow stands of the London Stadium but Saturday’s 3-2 loss to fellow strugglers Newcastle has tensions simmering once again. That was at least an acknowledgement of error, something that’s been almost entirely absent in the East End for some time. In the last couple of months, co-owner David Sullivan criticised Bilic for signing two players still on the club’s books and Moyes, whose recent record has been one of abject failure, started talking up his ability to manage “any club in the world” after a couple of wins. Over-promising followed swiftly by under-delivery has been a constant theme both on the pitch and in the boardroom over the last eighteen months. The botched stadium move, the constant leaking about plans to sign a ‘big name’ player that never come to fruition and the shapeless displays caused largely by a squad assembled without anything resembling a plan all contribute to a club that looks directionless. Moyes’ appointment last month was greeted with a mixture of bafflement and weary resignation. It seemed as if West Ham had become one of those clubs who cast their managerial net only as far as the list of those discarded by other clubs at a similar level. The Scot had been rewarded for taking Sunderland down in pathetic fashion with a bigger job. And it is a big job. For all the justified criticism of the move to London Stadium, it’s as good a deal for Gold and Sullivan as it’s a bad one for the taxpayer. And there are some decent players. Sam Allardyce, Bilic’s predecessor, left some well-drilled, capable defenders, while Manuel Lanzini, Javier Hernandez and Marko Arnautovic, who has been vastly improved under the new man, are attacking players who are, on paper at least, significantly superior to anything Rafael Benitez could put out on the eve of Christmas Eve. But it was the Spaniard who came away with the three points and moved his side back above his opponents. 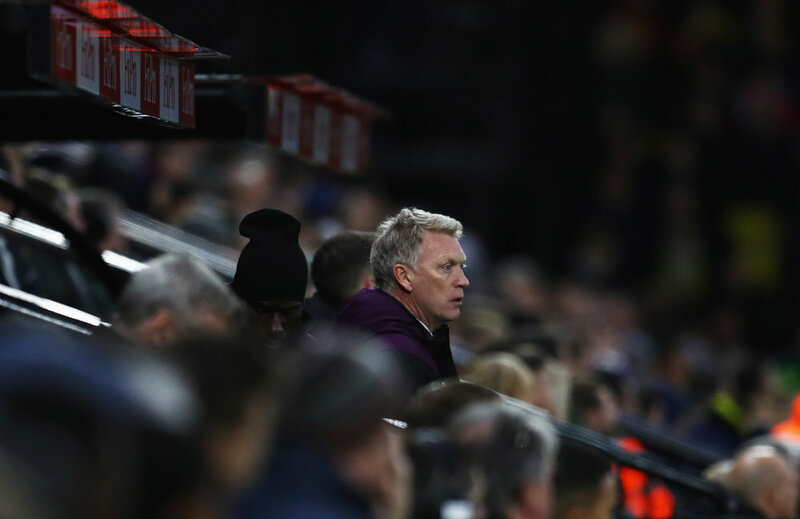 Moyes was right, West Ham made elementary errors throughout, with Andre Ayew’s penalty miss and a dreadful defensive mix up for Newcastle’s third the lowlights in a competitive field. As the hosts desperately searched for a leveller by reverting to the ‘lump it up to big Andy Carroll and hope for a lucky bounce’ method that’s proved so soporific and ineffective of late, frustrations around the stadium grew ever more vocal. The targets were everywhere, but too scattered for any one figure to bear the brunt. There were groans when Winston Reid shanked a pass behind Pablo Zabaleta as the home side were building up a head of steam, disbelief when Ayew stepped up to the spot and frustration at Moyes’ refusal to bring on Hernandez, the man heralded as the answer to the decade-old search for a decent striker in the summer, until it was too late. But little of it was directed at Moyes himself. Recent performances have brought him some time and the display of Arnautovic, the only player to applaud all sides of the ground after the defeat, offered proof of the progress he’s made already. The overall display was indisputably a regression though. As much as a win over Chelsea was a feather in a cap that’s grown ever more threadbare in recent years, Moyes is still far from accepted at West Ham. It’s difficult to see that anything other than a top half finish would change the perception that he’s an uninspired plaster covering a deeper wound. With only two top 9 sides slated for his next 10 games, Moyes has the chance to win over the skeptics in the early months of 2018 and secure a long term deal at a club that should still have plenty to offer any potential boss. But tensions are palpably close to the surface. A couple more results – and displays – like Saturday’s and it could quickly become unbearable. Olivier Giroud staked a claim for a starting place in the Arsenal team with the winner in a thrilling season-opening 4-3 victory over Leicester City in the Premier League on Friday.